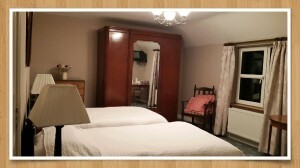 Generous sized bed room with Edwardian king sized bed and matching Edwardian wardrobe. Large bay window overlooking front lawn garden and farm pastures. En-suite bathroom with bath and overhead power shower. Room facilities: Free wifi, Tea/ coffee making facilities, Radio alarm clock, TV,hairdryer, garden view. Enjoy the view of front lawns from this bright south facing room. Ard-Lios meaning high fort or Arles in English is the name of our nearest village and also the name of our parish which came about with the building of the parish church in Arles village in 1868. This Church which can be seen in the distance from this room, was designed by architects Pugin and Ashlin in neo-gothic style; a most impressive building which is well worth a visit. Room facilities:Large en-suite bathroom with power shower, Free Wifi, Tea/ Coffee making facility, radio alarm clock, hairdryer. 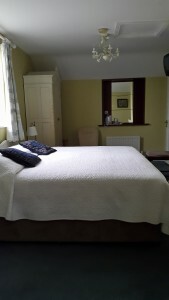 Generous sized bedroom with a southerly view over rolling farmland with the wooded Gleannmore in the background. Relax and unwind in this peaceful and bright room. Generous en-suite bathroom with bath and overhead power shower. Room facilities: Free Wifi, Tea/Coffee making facilities, radio alarm clock, TV & hairdryer. A soothing and relaxing stay is ensured in the this room. Fox Hill or fox covert is an impressive backdrop to Coolanowle Country House. En-suite bathroom with bath and overhead power shower. Comfortable and spacious en suite bedroom with a double and single bed, overlooking the front entrance, lawns and the majestic beech trees. The ancient townland of Ballinagall adjoins Coolanowle to the south. En-suite bathroom with bath and overhead power shower. Room facilities: Free Wifi, Tea/ Coffee making facilities, radio alarm clock, hair dryer & TV. Named after the townland adjacent to Coolanowle- Castletowns Church of Ireland dates back to the early 1800’s. The Castletown room is a large bedroom with two single beds and mahogany antique furniture. It has an ensuite bathroom with power shower. Room facilities: Free Wifi, Tea/Coffee making facility, radio alarm clock, TV, hairdryer. Occupancy 2 Persons: Double/ Twin room. Named to remind Bernadine of her homeplace which overlooked Carlow town. This light bright room has a large en suite bathroom with power shower. Comfortable and spacious en suite bedroom with a double and single bed, overlooking the lawns and the majestic beech trees. The townland of Rossena lies south east to Coolanowle where we have an outfarm rearing animals for Coolanowle Organics. The bedroom has a spacious En-suite bathroom with a power shower. Room facilities: Free Wifi, Tea/ Coffee making facilities,radio alarm clock , TV & hairdryer. 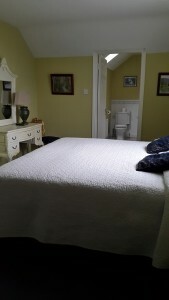 This ground floor suite sleeps 4 persons. It has it’s own external entrance adjacent to the main house. It has two interconnecting bedrooms; one with two single beds and ensuite with bath and overhead power shower and the other with a double bed and ensuite with a walk in power shower. It also has a mini kitchen with fridge,cooker hob, toaster, kettle and microwave. The front rooms bay window looks out onto the spacious lawns and orchard while the back room opens out onto a patio with a kitchen herb garden & glasshouse which services the kitchen for Coolanowle Country House. 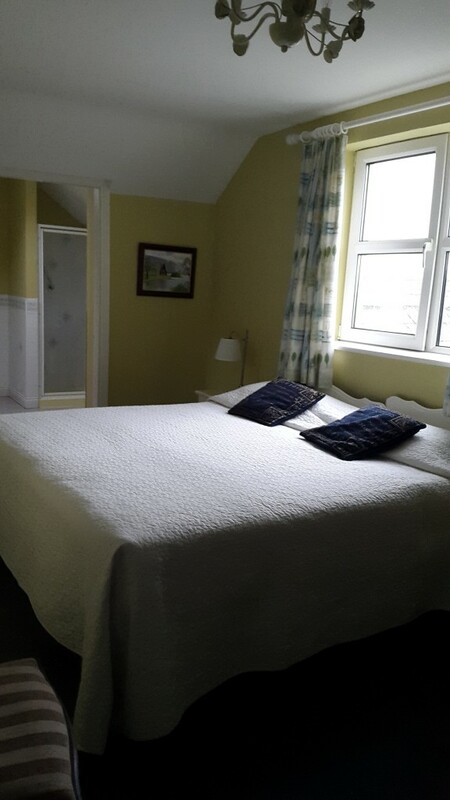 Suitable for small family /group for self catering or B&B.